I believe in being prepared for natural disasters, man-made disasters and pretty much anything else that could happen. I’m realistic enough to know that I can’t prepare for every potential disaster, so I’ve chosen to focus on having a well-stocked 72-hour kit. 72-hour kits are designed to be a grab and go emergency kit in the case of a natural disaster or emergency situation. A 72-hour emergency kit is designed to have enough food and equipment to survive for three days. You most likely won’t be comfortable, but you will survive. This post will cover all of the non-food items you should include in your bug out bag. Check out, What Food To Include In Your 72-Hour Kit for additional food recommendations. How should you carry your 72-hour kit? 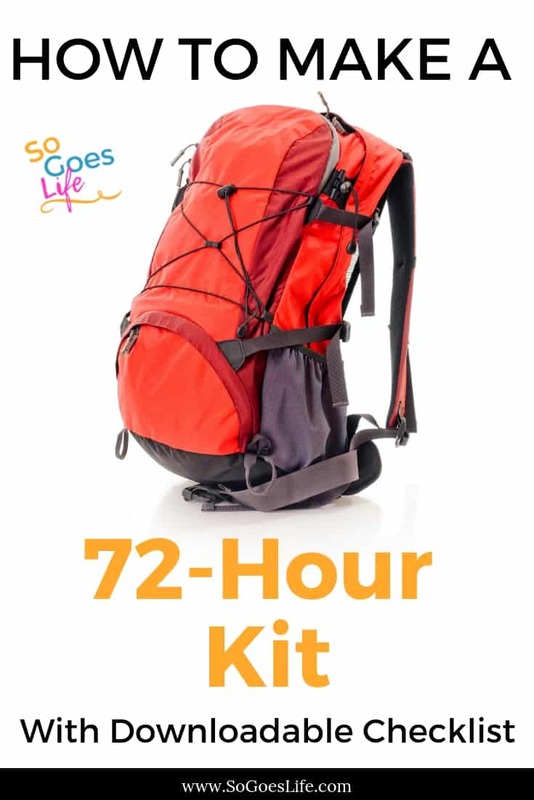 Personally, I recommend carrying your 72-hour kit in a backpacking backpack. Hiking backpacks are ultra comfortable and designed to hold a lot of gear. I do have friends who use regular suitcases and I even have a friend who uses plastic bins. Do what works for your situation. However, I like the flexibility of being able to easily carry my bag. I use my old hiking backpacks, but you can often find good deals on Sierra Trading Post, SteepandCheap or REI Outlet. I’ve also found good backpacks locally at Army Surplus stores, Goodwill and other secondhand stores. Minimum of one change of clothing and footwear per person. Personally, I recommend wearing a good pair of zip hiking pants that can be worn as shorts or pants like the Columbia Convertible Pants. Once you start wearing hiking pants, you start using them for everything – especially travel. I also include a sports bra, tank top, and a regular shirt. Always pack plenty of underwear and socks. You can wear the same clothing for a few days, but who want to wear the same socks and underwear. Check out these socks – You’ll never get blisters with these and you’ll love how comfortable they are – Goodhew Merino Wool Hiking Socks or Thorlo Coolmax Light Hiker Crew Socks. Include a pair of old running shoes or hiking boots. I keep my clothing in an old dry bag just in case it does rain. Rain gear (this isn’t a big issue in Phoenix, so I typically just toss in a cheap Survival Poncho). Blanket or sleeping bag – in the interest of space and because I live in Phoenix, I use these Therm-A-Rest Tech Blankets for my kits. Even if you live in a colder area, you should check out the Therm-A-Rest Tech Blankets, they are an awesome emergency blanket for your car. I can’t tell you how many times I’ve used mine in a whole lot of random situations – not just to stay warm. I also keep an extra Sol Survival Blanket just in case. You can find the Mylar blankets for cheaper, but they tear very easily and won’t stand up to multiple uses. My sleeping bags are also stored in my garage for quick and easy access during the winter months. Bandana – These can be one of your most useful tools. They provide sun protection, can help filter water, and are great for first aid situations. I typically stash a few of them throughout my packs. Baby Wipes – Best tool ever! I like the little folding travel hairbrushes. You’ll need enough for bathroom sanitization and depending on your food choices, kitchen sanitization. My sister had to use a sock once on an extended hiking trip – Don’t make this mistake. Wag Bags/Poop bags These are specialized bags we use for long camping trips that are designed specifically for this purpose. Yes, it is disgusting, but they are a lifesaver when you don’t have other options. I recommend a few extra zip lock bags for double protection. Your nose will thank me. It is also a good idea to have a large plastic bucket with a portable snap on toilet lid. Line the bucket with a garbage bag prior to use for easy cleanup. It helps to include kitty litter each time you take care of business to absorb odors. I don’t keep this in my to go kit, but have it at my home just in case the power and water go out. Flashlight and extra batteries – personally I prefer using headlamps. Having your hands free makes life so much easier. Mess Kit – Plate, Bowl, Cup, and utensils. If you read my 72-hour kit food post you know that I like to keep my food very simple. If you have followed my food recommendations the only item on this list you need is a spork. I prefer the long-handled type, but at an extra 3-4 dollars am not sure they are worth it for a 72-hour kit. Can opener or multi-tool like the Leatherman New Wave Multitool – personally I don’t use cans in my kits, but definitely like the idea of having a good multi-tool. These tools can be expensive, but this is one area you really don’t want to skimp on. Tent – I don’t keep my tent with my kit. I have it easily available in my garage to grab if needed. I do however keep 2 pieces of Tyvek with 100 feet of paracord and 25 feet of climbing webbing in my kit. Jet boil or another simple method of heating water. For space, I prefer the backpacking canister stove systems like the DragonPad Canister Stove. If you go this route make sure and include a cup for heating. Water purification method if you are unable to boil water. Personally, I want to be able to do both. I use my trusty Katadyn filter, but love some of the new gravity filters on the market. I just haven’t found an excuse to buy one yet. Map of local area and GPS Unit. I know it is old fashion, but make sure you have a paper map. You can’t count on your phone or even the GPS unit to work. Whistle and a hand-held mirror. I know a lot of people who also include 2-way radios. Radio with access to NOAA weather reports. Personally, I prefer the kind with the hand crank and solar powered options. Either way, make sure and include extra batteries. Trash bags and multiple ziplock bags in a variety of sizes. Solar Charger – This is the one I use. It has kept my phone and Ipad juiced up on multiple occasions but isn’t going to run your laptop. First Aid Kit – I need to do more research in this area and put together a good kit that is actually usable instead of the cheapo ones I keep buying. If you are looking for information on natural first aid kits, this post by Just Plain Marie is a great place to start – How to Build a Natural First Aid Kit For Your Home. Leukotape – This is the best athletic tape I’ve found. It is significantly better than moleskin. I use it for hot spots and taping up wounds. It will stay on your skin for days if applied to a dry spot. I seriously love this stuff and keep some in my car, purse and all my first aid kits. Most important – Water, water, water. Everyone’s bug out bags are slightly different based on individual needs and geographic locations. Before putting together your list write down the potential situations in which you may need a survival bag. Look at various scenarios and begin to plan your lists based on your individual needs. The chances of me experiencing a hurricane are slim to none. However, a power outage in the middle of the summer could be deadly in Phoenix. Review potential emergency situations and prepare accordingly. If you live in a cold weather area, having a heating source is significantly more important then for someone in Phoenix like me. Conversely, most areas don’t need to plan for as much water as I do. This definitely is not an all-inclusive list but is a good starting point. I’ve been working on my 72-hour kits for years. I’ve adjusted and changed them multiple times as I’ve gradually collected extra gear. I know it seems daunting, but I’ve found that if I just purchase a few items a month I don’t get overwhelmed. Put together a list of the items you are missing and watch for sales. The goal is to add a few new items each month. 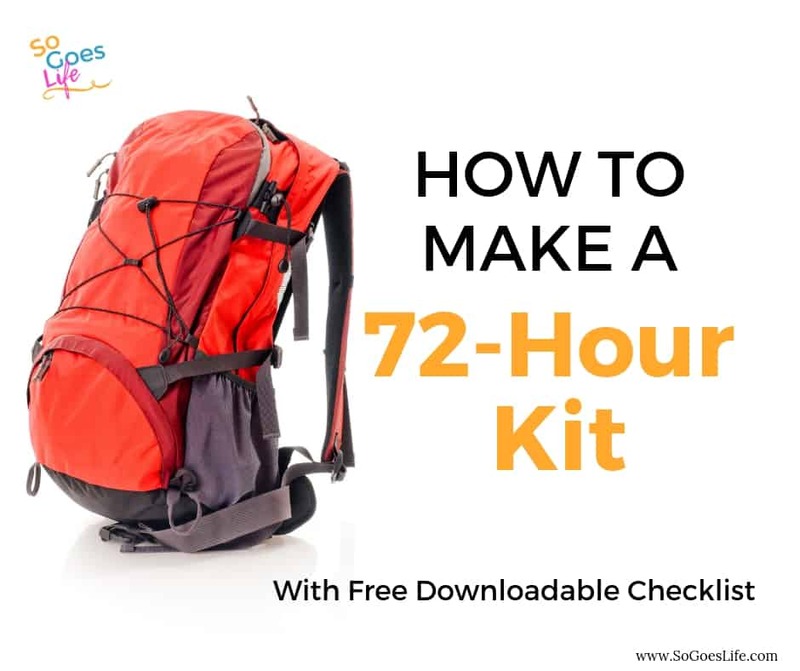 Having a premade 72-Hour Kit is a great starting point, but most of the premade kits are pretty basic. If you do go this route, don’t order the kit and then stick it in the closet. Review the items in your survival bag carefully and supplement as needed. Please let me know if you have any additional recommendations or products I should try. PS. Don’t forget to check out What Food To Include In Your 72-Hour Kit.